Discount available! 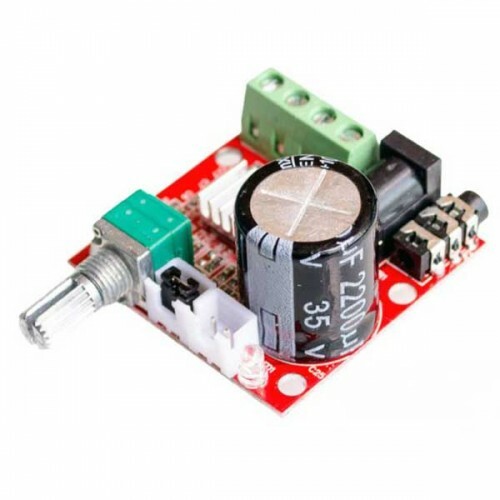 Recommend Audio Stereo Amplifier Board Dual Channel - 2x10 watt to your friends and get your Discount. Based on chip PAM8610, this little Class D stereo amplifier is able of providing 10 watt maximum power. There is a potentiometer for adjusting the volume and 2 jumper (one for the Mute and the other for the circuit breaker). Power: 7.5 Vdc to 15 Vdc (12 Vdc recommended), the consumption at rest: 20 mA, efficiency: 90%, frequency response from 20 Hz to 50 kHz, size (mm): 40x40x23, weight: 25 g. Suitable for use with small MP3 players. Recommended supply voltage: 12V, the center PIN of 12VDC is "+"